Buying a new home or property can be an exciting, yet challenging time. You need someone you can trust; someone who will understand your needs and wants and who will work hard to find what is best for you; someone who will walk with you every step of the way. You need the right Real Estate Agent to represent you in the most professional and personal way. At Scenic North Properties, we are dedicated to providing you with all of this and more during your entire buying process. 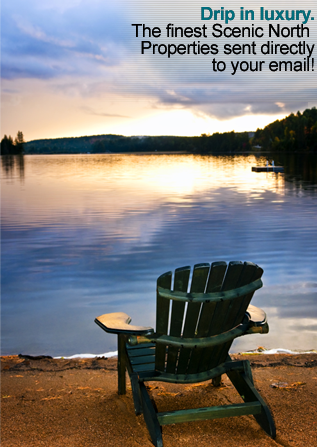 Whether you are looking to buy a waterfront property, lake cabin, or new home, we are here to help you. Our professionals have a great knowledge of the market. They can help you focus and visualize what you are looking for. So, whether you are looking for your first home, or your retirement home; relocating your family, or starting a new business; looking for recreational property, or for your long awaited dream home…. Let Scenic North Properties help you believe in your dreams. When selling your home or property, it is very important to choose the right Real Estate Agent. You need someone you can trust and have a good, solid relationship with. Scenic North Properties is dedicated to providing our sellers with the most professional and personal service possible. Our professionals provide the most innovative marketing and selling techniques and we have the knowledge it takes to navigate the current, highly demanding buying and selling market. We have a strong focus on the Internet since 80% of buyers out there find what they want on the Internet. The key to good selling is getting the maximum exposure of your property to as many buyers as possible. We provide a staging professional who can help you prepare your home to get that immediate positive reaction to your listing, which is crucial to finding that right buyer. Let Scenic North Properties give you your highest advantage and the top dollar for your home or property.